We’ve already expressed our excitement for Samsung’s mammoth new phone, the 5.3-inch HD Super AMOLED Galaxy Note, in our previous coverage. Well the good folks over at Techblog.gr got the chance to run the Quadrant benchmark on the device at the IFA show floor and got some unsurprisingly impressive results. 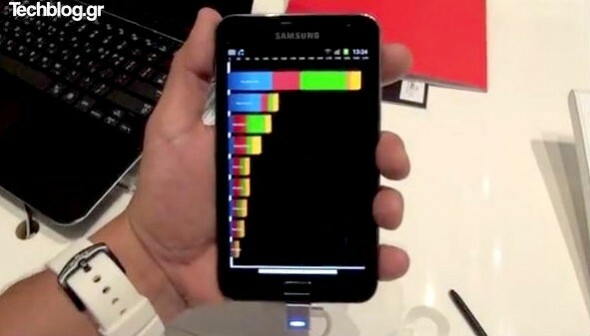 The Note runs on a dual-core Samsung 1.4GHz processor and managed to score 3,624 on Quadrant, ever so slightly better than even then 1.2GHz Samsung Galaxy S II score, putting it ahead of every other Android smartphone in terms of processing performance. Of course, performance doesn’t come cheap, the Samsung Galaxy Note is expected to hit Scandinavian shores — Norway, Finland, Sweden and Denmark — first, in November, with a price tag of around 670-750 euros ($1,000). The phone is then expected to arrive in the UK a the start of 2012 but no US availability in the horizon yet.